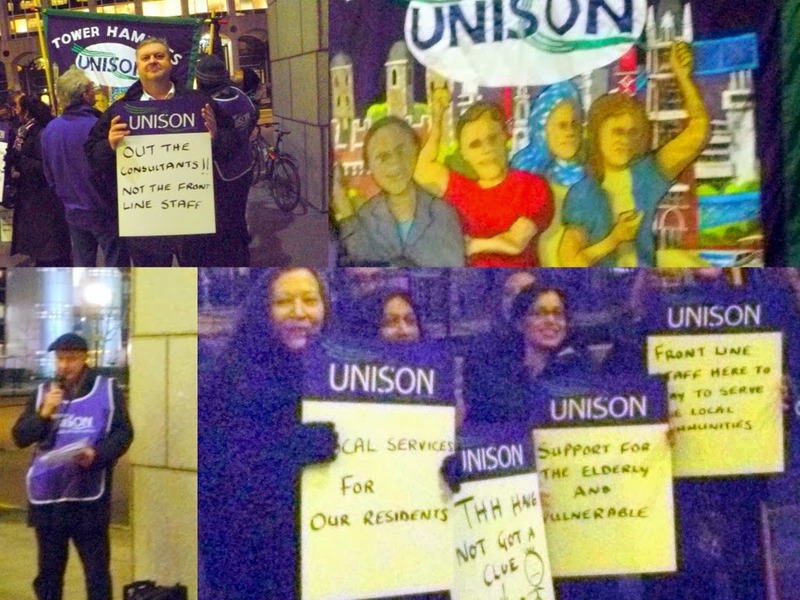 Picture collage is from a lobby last night outside Tower Hamlets Town Hall. UNISON members who work for the the ALMO Tower Hamlets Homes were protesting against plans to cut the number of estate patches from 27 to 18. This would increase the size of each area that a Housing officer would be be expected to look after by 50%. This seems frankly daft at a time when due to welfare cuts and austerity you will need greater estate management resources in order to support and protect residents and enable the organisation to function (whose motto is after all "helping to build happy, safe and strong communities"). Most Housing organisations in London are prioritising estate management and many are reducing patch sizes in order to do so. The members I spoke to at the lobby were very experienced and capable staff who were genuinely worried that the service to residents would suffer and they would be unable to do their jobs properly. I knew many of those of those present from when we all worked directly for the borough and from the days of the Tower Hamlets Housing Strike of 1999 which was also about protecting local housing services. I gave a personal message of support to the lobby as a local housing colleague and UNISON NEC member. Everybody was really pleased that Labour Candidate for Mayor, John Biggs, has promised in his manifesto if elected to scrap Tower Hamlets Homes and bring it back under the control of the Council.